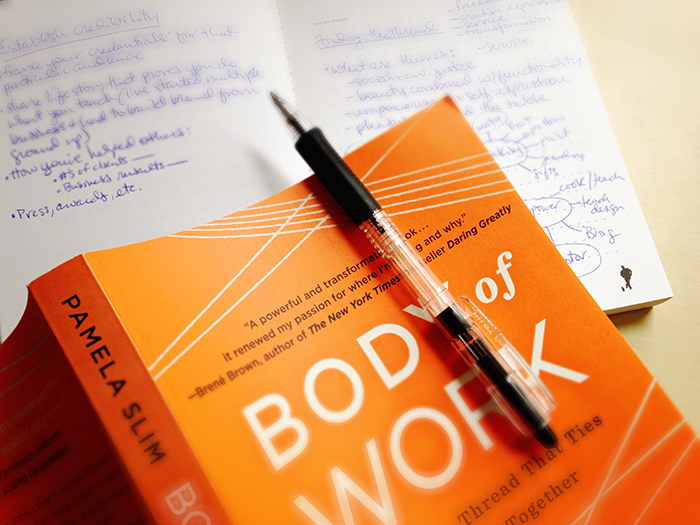 In Pamela Slim’s new book, Body of Work: Finding the Thread That Ties Your Story Together, you are likely to locate yourself on its thoughtful question-filled pages. Award-winning author, business coach and speaker, Pam has touched a nerve at at time when people are eager to use all of themselves in their work. • What will I regret not doing? • What dragons do I need to slay? • What strengths come naturally to me? • Who are the key people in my circles? • Is there a good model out there for what I want to do? • What kind of legacy do I want to leave with my work? Over the last few months, I’ve found myself recommending Body of Work to nearly everyone I talk to. I did have the pleasure of doing a workshop with Pam, but no, I’m not getting any kickbacks! Something is in the air. • An HR manager quits her job at a relief organization and returns to her art that she had shelved long ago as she figures out her next move. Despite new job offers, she’s not leaping too quickly. Instead, she’s wondering how she can bring more of herself into her work. • A food product developer-turned-facilitator is thinking about her work legacy, and is also considering how to find fulfilling contract work that plays to all her strengths, now that she’s gathered quite a few. • An arts council director quits her job to pursue a love of video and storytelling, weaving it into food, another passion. Too often we define ourselves by one role here, one role there. In the past, we’ve been almost encouraged to leave our personal life out of our work, creating self-made silos. As such, we might not see a connection between our volunteer life, our hobbies and our work life. Missing those connections means overlooking opportunities for more rewarding work. • Economic realities are forcing people to rethink and redefine how they work and what they bring to the table. And for many, there’s a growing desire to leave a positive mark on the world. • In turn, many people want to craft their own role(s) rather than fit into a neatly defined, and limiting, one. • It’s far easier to create a business or have side gigs, from self-publishing to selling handmade goods on Etsy to offering online workshops. • Training that used to require a lot of money or being on location is a thing of the past. • People expect more authentic experiences from businesses, both from their own and businesses they interact with. • Get personal satisfaction by having a more complete picture of your contributions. • Have a richer story to use for crafting your own enterprise or getting more of the kind of clients that allow you to use all of you. • Better sell yourself to prospective employers, not to mention be more clear about who you want to share your gifts with. A great example of a side hustle is an architect I met recently. I was familiar with her felt artworks though. After being laid off, she took a job working at West Elm. When they found out about her artwork, they gave her gallery space in the store. Now she’s working at an architecture firm again, but because of her side hustle, where she still works once a week because she loves it, she was able to get valuable exposure for her art. I can imagine many professionals not wanting to work in a service position, but her open mind opened doors. Body of Work is a great read for anyone feeling the pull to document, reflect on and put into service all or most of their gifts for a thriving future. Despite Pam’s many successes and accolades, she is decidedly down to earth, often sharing stories of her own challenges. It’s rare to find someone who speaks with authority, generosity, humor and practicality all at once. This book is very hands on, clearly structured and you are left with a satisfying whole picture of how the parts of you come together. My guess is, you’ll dip into this book over and over. Pam, who is also a mixed martial artist, is known for encouraging people to embrace “full color, full contact living.” Body of Work asks us to do just that.